In December 2016, we launched our first Kickstarter campaign to donate posters to Women’s Marches across the country. We initially set out to raise $1,500 to donate 1,000 posters, but ultimately ended up significantly eclipsing that goal. By the end of the campaign, we had raised $7,500, which was enough for us to print and donate 15,000 posters. Every day of that process, from planning to execution, was a learning opportunity for us. Despite the many hurdles standing in our way, we relied on our passion for the project and quick thinking to soldier through and deliver on our promise. When we decided to redesign the United States. Constitution we thought, “Why don’t we create another Kickstarter campaign to raise the money?” We approached our second campaign armed with the learnings we took from our first. In doing so, we set a higher fundraising goal, created a plan for promotion before launch and we came up with effective ways to keep the momentum throughout the 29-day campaign. 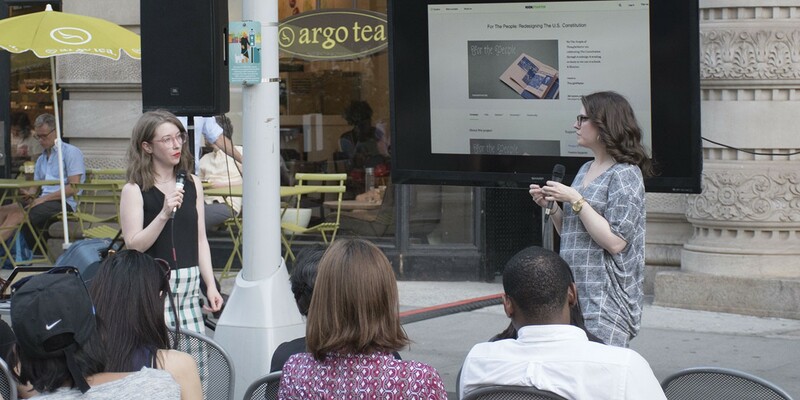 As part of the Flatiron 23rd Street Partnership’s “Tech Tuesday” series, ThoughtMatter Producer Whitney Burnett and I shared our top 10 tips for a successful Kickstarter campaign. We’re by no means Kickstarter experts, but we hope this list will come in handy if you’re planning to launch a Kickstarter campaign of your own. Be sure to target your existing networks. By that, we mean friends, family, your social media following, book club members, intramural sports teammates, etc. Tell anyone and everyone you know that you are launching a Kickstarter and what your product is. This is a great way to build a support network as well as pressure test your idea and get some initial feedback while you pull your campaign together and prepare to launch. An audience outside of your network is extremely important as well. In order to ensure your idea and product reach more people, approach editors and bloggers about your campaign. If your story is compelling, they will likely want to publish a story about it. Having press about your project helps to build your credibility, spread awareness about your project and make people more likely to back it. Data shows that a non-holiday Tuesday at 7 a.m. Eastern Standard Time is the best time to launch a Kickstarter campaign. We broke this rule. Twice. It’s okay to break the rules as long as you know the rules. There are many factors that go into deciding when to launch. We launched our campaign for the Women’s March posters four days before Christmas, but we decided that was the best option because we were working toward the set date of the march in January, and wouldn’t have benefitted from waiting for the perfect date and time to launch. For the Constitution campaign, we loved the symbolism of launching on Independence Day, which happened to be a Tuesday this year but was also, obviously, a holiday. If you are unsure what the best time is for you, stick with early Tuesday morning. Once you launch your project on Kickstarter, you cannot change your funding goal, so it’s important to set a budget and stick to it. Factor in every cent when developing your budget — think about how much it costs to produce each reward, postage, packaging, advertising, storage space rental…EVERYTHING! Also keep in mind that Kickstarter will keep 3–5% of the campaign earnings if your project is funded. This sounds obvious and maybe it is. Your campaign is one of thousands on Kickstarter and you need to do everything you can to stand out from the crowd. Make sure your campaign tells a great story and put a bit of yourself into it. Backers like to get behind the people behind the project. Consider making a video or two for your campaign; maybe one as an introduction to the project and why you believe in it, and another to demonstrate or display your product. It’s typical to offer your final product as a reward to your backers. Think about other rewards your supporters might be interested in. Perhaps they love your project but can’t afford it — that doesn’t mean they don’t want to contribute! Offer a range of reward tiers to give people an opportunity to get involved at any level. People love options! To ensure that your social media presence is consistent and capable of grabbing attention, it’s a good idea to plan out what you will post to your social channels ahead of time. This will allow you to feel confident that your marketing efforts are working as hard as possible and gives you the opportunity to react to things quickly. We’ve learned it’s best to have a reserve of fresh images on standby to use when things come up, whether it be an update because you met your goal or a countdown during the final days of your campaign. Your supporters want to know that you can deliver on the promise you’ve made. A good way to prove that you can deliver is to make a prototype of your product and feature photos of it in your campaign. We’ve also found that photos of a prototype are much more compelling than a rendering or comp, and will likely lead to more backers. We’ve already mentioned the best time to launch, but we’ve also found that it can be helpful to “soft launch” ahead of your official launch date. For our Constitution campaign, we publicly announced the campaign on July 4, but we actually went live on Kickstarter the weekend before. Those extra days gave us a chance to share with our personal networks, friends and family to get the ball rolling. That way, when people landed on the campaign on July 4, there was already forward momentum. No one likes to be the first at a party, and no one likes to be the first backer! We’ve learned that Kickstarter campaigns are a lot like small businesses. From the moment you have an idea to packaging the last box of rewards for your backers, Kickstarter campaigns are a lot of work! You’ll be pushed to wear a lot of hats (strategy, finance, social media, customer services, logistics planning and many, many more) so you should be prepared, and don’t hesitate to ask for help when you can. The unofficial 11th tip — remember to have fun! Through the complicated spreadsheets and flood of solicitation emails from “Kickstarter experts,” don’t lose sight of your mission and why you started your project in the first place. Kickstarter can be a powerful platform but you’ll only get out of it what you put in. Remember to be passionate about your project. If you’re not then no one else will be! This post was written by ThoughtMatter Client Services Director Martha Kirby. ThoughtMatter is a creative branding, design and strategy studio in New York City’s Flatiron District.